In mrmacrum’s “Bed Bugger”, we had a brooding tale of darkness and justice. The use of dialogue worked well in this piece as a tool to drive the story and bring life to the characters. I have to confess I’d never heard the term Bed Bugger before, I so looked it up – should I ever need moving services in the US, I’ll now be thinking twice before calling one of them up. Vagrant Rhodia gives us the tale, “Elysium?” (Nice use of question mark). In 186 words we are granted some wonderful visuals and scene setting, including ‘an exchange of paper is made for a “flavor explosion in every bite”’ – so good. There were many other wonderful examples of words and phrases that richly described the scene. In the Brian S Creek classic, “Closing Time”, we’re in the thick of the action, in the middle of an armed robbery. The dialogue works really well. It’s not just what is said, but when it is used and how it paces a story. I know Brian is proud of his progress in this area of his writing and he should be. On top of the dialogue and the action, we have a great ending. Casey Rose Frank gives us a fine example of emotional and refined flash fiction, with “Beautiful Jukebox Emaline”. Her character, Emaline, is so giving, so caring and selfless that her beauty shines through. But the world can be a cruel place and her talents are confined to safe harbours for fear of others. I wanted to transport myself to the scene and attempt to help her, which shows just how well the character is written. Deb Foy is a word magician and her story “The Difference Between Envy and Jealousy” is a great example of what she does so well. The following lines worked really well, “The blonde one chews her orange gum open-mouthed and speaks so everyone can hear her. “, “Mei slurps her noodles then pinches the fold around her eyes, wondering if she looks like they look. Her black irises follow their blue ones to the table by the window.” – a very fine example of showing and not telling. I really enjoyed “Table Seventeen” by F.E. Clark. Great writing techniques used to hide the extra table and make us want to know exactly what was going on. The limo was a wonderful idea. I’m not entirely sure if Mr White is someone akin to Mr Grey from Fifty Shades, or another character from Tarantino (or something else entirely), but that’s the beauty. F.E. Clark knows, while the rest of us ponder. A.J. Walker produced a piece of flash fiction with “Ripples”, that dipped in and out of dreams (or was it actually time travelling, or regression). Wonderful descriptions. Exotic visuals. The wonderful ‘dream’ sequences reminded me of one of my favourite films, Inception (I hope you don’t mind the comparisons, A.J.W). I love the fact that I’ve read it many times and I’m still pondering the dream aspect. Elaine Marie McKay – a master of dark power with miniscule word-counts. “Cigarette Breaks”, is meant to be edgy and make us feel uneasy. It thoroughly succeeds thanks to the well written POV of the narrator, as they describe the object of their affections. I loved this line, “I watch his arm brush against your nyloned thigh which makes you search for more of your uniform’s flimsy material”. From this I felt unease at the way she was being treated by the customer, while always being aware of the equal unease I felt at the watching narrator. Voima Oy is a storyteller of the finest quality. I adored the idea of disappeared people returning. Their unexpected return seeming to cause everyone confusion and disruption. This felt like the 2nd part to a story (sorry if it was and I’ve missed the first one, or if it is a tale that I should know). It stands alone as a great piece of flash as we have an entire world, filled with mystery and interesting characters (BobbyZen is just such a great name). I’d love to know what happened before and what happens next. Catherine Connolly gives us the vivid “The City Of Innocent Deaths”. It is a story filled with stunning words and deep themes. It feels like the narrator is losing grip on reality and living in worlds between dreams, paintings and reality. Too many wonderful words to praise, but I particularly enjoyed the stunning opening. Runner up, Casey Rose Frank, for the wonderful (and beautiful) character and my slightly irrational longing to help her. Well done, Casey. Runner up, Catherine Connelly, for the fantastic beauty of the words and conjuring of worlds half-remembered. Top work, Catherine. Congratulations, Brian for a story that combined many different elements and a highly enjoyable ending. A deserved winning story. Congratulations, Brian! Your story will be featured as Wednesday’s HumpDay Quickie. 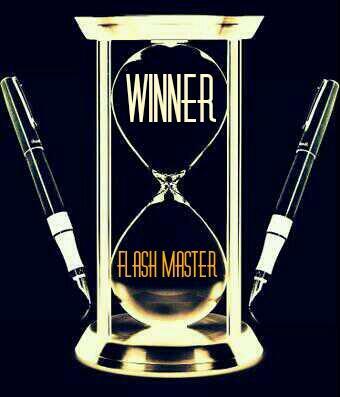 As February draws to a close, keep your eyes on your inboxes, Flash Masters. I’ll be recruiting judges for March later this week. Next weekend, Catherine Connolly steps up as Flash Frenzy judge. Hope to see you all there.